Is online flash sale a trick or joke on customers? Or this is software intended publicity to attract attention of buyers. How all unit of a mobile can be sold out in less than 1 min. This is really a pathetic experience for thousands of customer. This is known that A flash sale is a promotion for a short period of time. and the quantity is limited. But it does not mean too short time to see buy option, Is it all about less than nano second span of time. Here we are going to share worst experience of a customer of last 2 min of flash sale, who tried two times to buy Honor 9 lite in Flipkart Flash Sale. This is shared by a loyal customer of Flip kart. 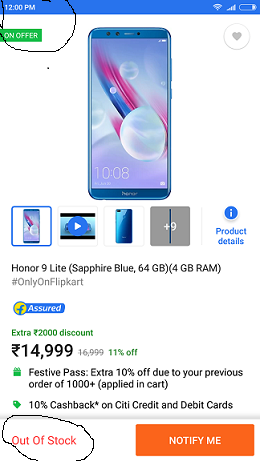 ” I Had to buy Lenovo’s Honor 9Lite in Flipkart Flash sale. So I was ready with my bank card. I am having Airtel broadband connection with 4 Mbps speed, Means there was no issue with internet speed. I was constantly watching Flipkart Flash sale screen on my device, It was showing every second which was passing for flash sale.. Tick.. tick 10 second to go, 9 second to go……2 second to go,1 second and boom what is this, even for a fraction of second screen did not show “Buy” or “Add To Cart” option. What did it show “Sold Out” just after. Guys how come this is possible. Now I have lost all my faith in Flipkart. Are you guys doing some kind of prank in form of Flash Sale. I am sharing a screenshot, there you can see current time and status of sale marked in circle. So this was the pain of almost each of customers who waited a long time or woke up till 12 O’clock night to buy Smartphone in Flash Sale. This is the reality of flash sale via some tweets. That will b another Bogus Sale.. I've lost my trust in #FlipkartFlashSale or do we all it #FlipkartBogusSale.. sad, sad service.. Flash sales is a extremely effective method for quickly selling product and turning a negative into a positive in a matter of hours. Flash sales are a great way to sell items that are either out of season or have been sitting in catalogues for some time. This leads to lower operating and inventory costs on the back end.